This blue jay was so fun and easy to make! Being able to use the cardinal dye to create a blue jay is such a bonus! Pigment inks and embossing powder makes it easy to create the perfect shading and and adds depth. The pine cones are also very easy to make! The die set from LeCrea 3-D dies, allows you to make a small pine cone (as shown) and a larger pine cone. All of the dies for each layer of both sizes are included in the set. Add snow to the pine sprigs and pine cones and you will be well on your way to a winter/Christmas version of this lovely card. Cut a piece of navy blue card stock 10” x 7” and fold in half. Cut a piece of ivory card stock 4.5" x 6.5”. Emboss the right half of the card using the embossing folder but only run through your die cutting machine about ¾ or the way. 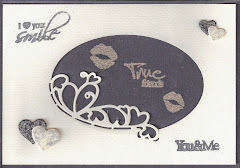 Remove the embossing folder and place on the last part of the card and run through your machine again. This will give the appearance of two tall pine trees in the background. Attach the embossed layer to the card using double-sided tape. Use the ponderosa sprig die to cut all of the pine sprigs at once from dark green card stock. Die cut the branch from brown card stock. Die cut all of the layers for the small pine at once from light brown card stock and then emboss using your foam mat. Repeat x1 for the second pine cone. Place the branch on the card as desired using a glue pen. Use brown/black inks to color the pine cone. I added some clear embossing powder to add some shine to the design. Place the 3 layers on top of the largest layer using foam tabs. Lay out your ponderosa sprigs and pine cones in the desired positions then attach to the card using foam tabs. Use some pigment ink on the body of the blue jay to create the appropriate coloring. I used a photo from the web to give me some guidance about the coloring. First I used a lighter blue then went over some of the areas in a darker blue. I added stripes of black to the tail and the ends of the feathered wings. Black ink was used for the beak and the edges of the white face mask. I used grey along the bottom edge of the breast. I used several layers of pigment ink to get it right. With each layer I added some embossing powder to the pieces to set the ink and create a shine to the design. Use an alligator clip and small cotton piece to be more precise with your shading. Glue or use double sided-tape to attach the black facemask (I put black behind the eye) to the blue jay as shown. Attach the wings to the body using foam tabs. Attach the feet to the body of the blue jay using a glue pen. 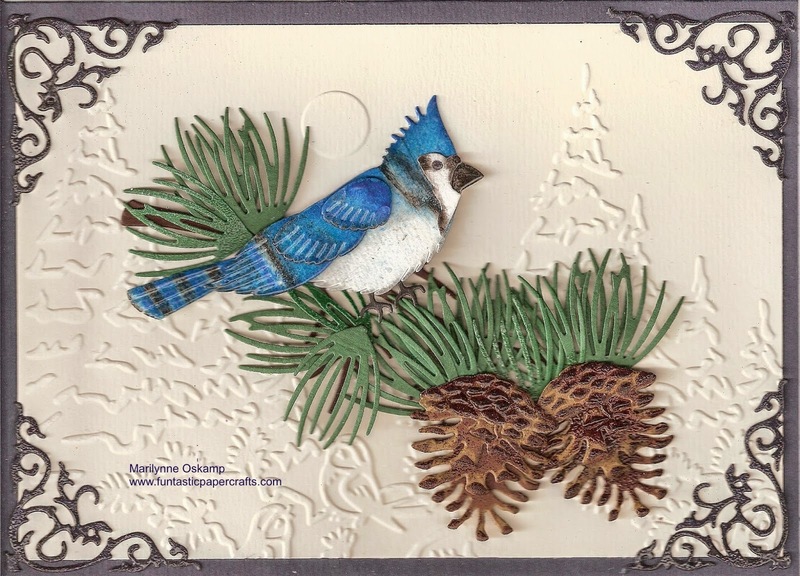 Attach the blue jay to the card using foam tabs. Die cut 4 corner pieces from navy card stock using the Tattered Lace Victorian corners. Rub over the designs with the clear embossing ink and then add embossing powder and heat with the heat gun. This will create shiny corners for your card if desired. Attach to the card using a glue pen. This cardinal was so fun and easy to make! Having all of the pieces together in the die set is great and makes it very simple. Add snow to the pine sprigs or cut from glitter white paper and it will be a lovely Christmas card. Although I often think of cardinals at Christmas time, there is a couple in my back garden that come to visit mainly in the summer. My next project is to try to use the same die set and create a Blue Jay…stay tuned! Cut a piece of green card stock 10” x 7” and fold in half. Cut a piece of ivory card stock 4.5 x 6.5”. Emboss the bottom third of the card using the Embossing folder. Score a few lines above the embossing as shown to make it look like a fence. Attach the ivory embossed layer to the green card using double-sided tape. Use pigment ink or embossing ink on a piece of lightweight green cards stock to add variation to the color. Add embossing powder and heat to create a sheen. Then use the ponderosa sprig die to cut all of the pine sprigs at once. It is easier to create the desired colored paper first then die cut the pine sprigs rather than do each one individually. Place the branch on the card as desired using foam tabs. Add the ponderosa pine sprigs to the branch to create the pine branch using foam tabs. Use some pigment ink on the body of the cardinal to create depth and shading. I used some red over the body and some orange on the beak and then added some brown/black over the wings. Sprinkle with embossing powder and heat with your heat gun. Repeat the above step until you have the desired shading. Glue or use double sided-tape to attach the black face mask (I put grey behind the eye) to the cardinal as shown. Attach the feet to the body of the cardinal using a glue pen. 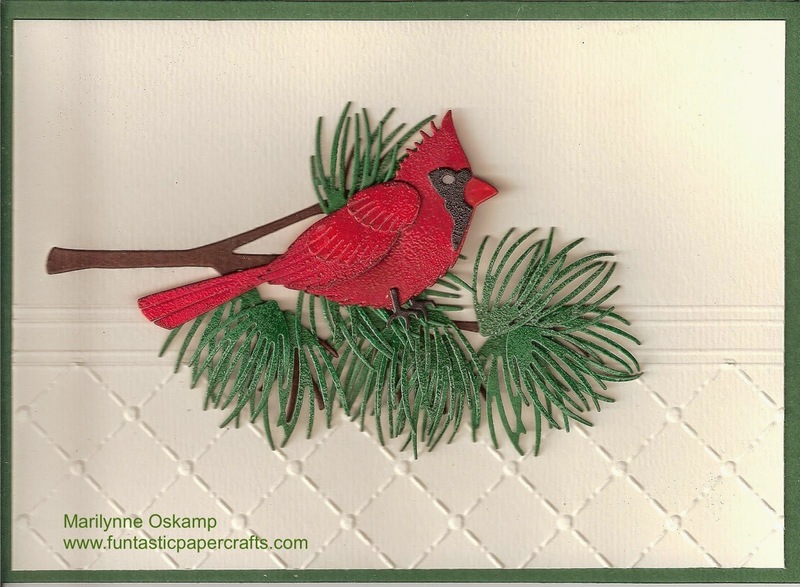 Attach the cardinal to the card using foam tabs. I thought I would post another masculine card since Father's Day is coming in a few weeks. This card is for any car enthusiast in your life. The card includes the "Old Fashioned Car" with a background of gears. Add the perfect sentiment using the words from the Tattered Lace Sentiment Die. Cut a piece of dark brown card stock measuring 10” x 7” and fold in half. 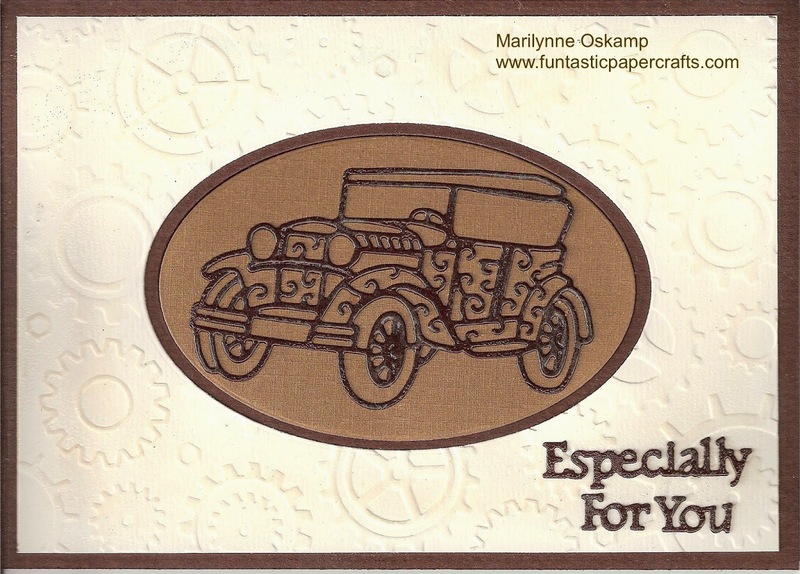 Cut a piece of ivory card stock measuring 6 ¾” x 4 ¾” and emboss using the Gears Embossing folder. Die cut the largest oval from the nested die set from dark brown card stock and the next smaller oval from light brown card stock. Die cut one Old Fashioned Car from dark brown card stock. Die cut a sentiment using the Tattered Lace sentiments die from dark brown card stock. Rub the clear embossing ink over the Embossed ivory card and apply clear embossing powder. Heat with your heat gun to melt the embossing powder. This will create a glossy finish (difficult to see in the scanned image). Rub the Old Fashioned car with the clear embossing ink and apply the embossing powder. Heat with heat gun to melt the embossing powder. Repeat if desired. This will create a glossy finish to the car. Repeat the above step for the sentiment as well if desired. Attach the dark brown oval using the 1.5 mm foam tape followed by the light brown card stock and then the car. Attach the sentiment as desired using a glue pen. I think anyone who makes cards always wants unique ideas for the men in their lives. 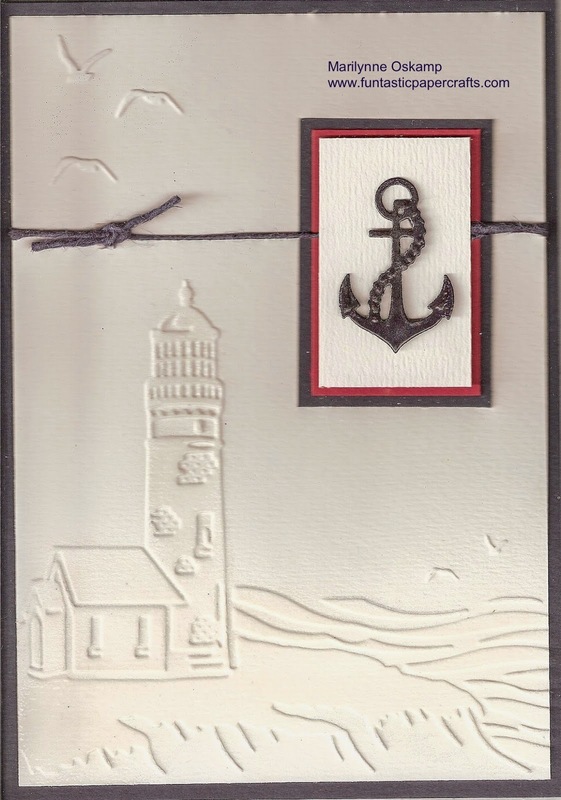 Ecstasy Crafts has new embossing folders and this beautiful lighthouse lent itself perfectly to a masculine card. I used clear embossing ink and clear embossing powder over the anchor and the embossed parts of the white card to make both "shiny". It is difficult to see in the scanned image but adds a beautiful contrast. to the card. Cut a piece of navy card stock 10” x 7” and fold in half. Cut a piece of white card stock 4 ¾” x 6 ¾”. Emboss the white card stock using the lighthouse folder. Rub the clear embossing ink over the embossed parts of the white card. Sprinkle the embossing powder over the embossed parts, tap off and then heat with the heat gun to melt the embossing powder. Die cut the anchor from the blue card stock and 2 starfish from the white card stock. Rub the clear embossing ink over the anchor and the starfish. Sprinkle the embossing powder over the items and then heat to melt the embossing powder. You may wish to add another layer of clear embossing ink and embossing powder to add more gloss. 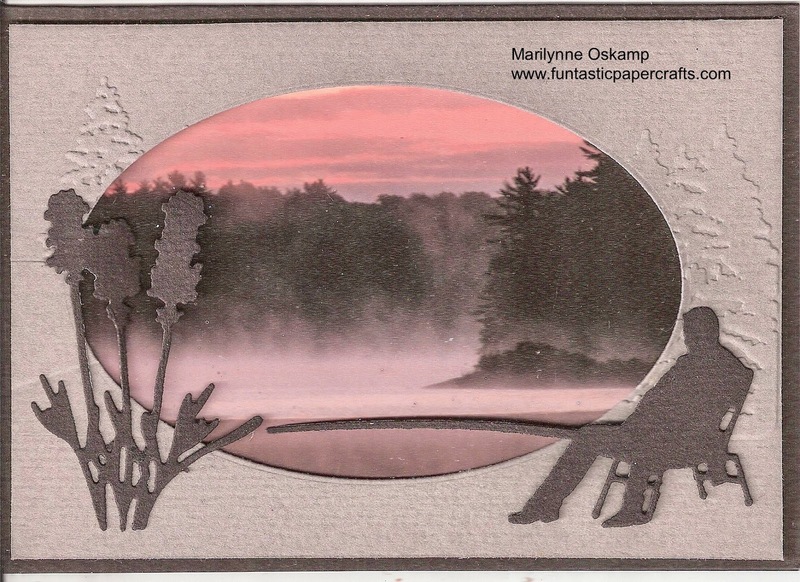 Die cut a rectangle using the largest postcard die from the Marianne Postcard frames. Cut a piece of blue card stock approximately 1 5/8” x 2 ¼”, a piece of red card stock 1 3/8” x 2” and a piece of white card stock 1 1/8” x 1 ¾”. Attach the red rectangle on top of the blue rectangle using double-sided tape. Use 1.5 mm foam tabs small or cut the regular sized ones into small pieces. Attach the anchor to the white rectangle using these small foam tabs. Cut a piece of blue hemp cord or other twine to cover the front of the card and fold over the edges. Tie a knot in the twine or several knots as desired. Place several foam tabs or a piece of foam tape on each end of the ends of the white card stock, leaving the opening in the center to allow the twine to pass through. Place the twine on top of the red rectangle and then attach the white rectangle on top. Attach the anchor combination to the front of the card using double-sided tape.Stretch the blue hemp cord across the card and attach to the back of the white embossed card using double sided tape. Attach the white embossed design to the blue card using double-sided tape. 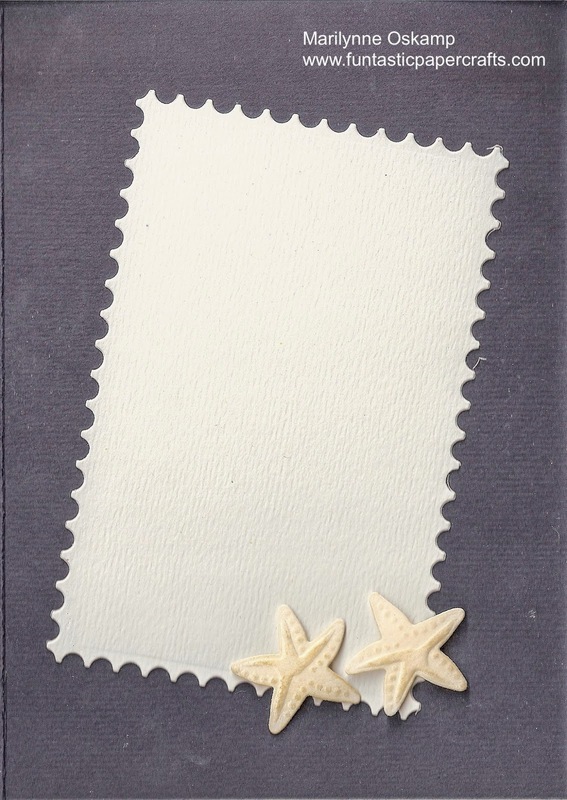 Attach the white rectangle and starfish to the inside of the card as desired. I saw another card through pinterest that used a punch to create 3-D daffodils and I immediately knew exactly which embossing punch I could use to create beautiful 3-D daffodils. I used a garden theme as I cannot wait to be able to get out and work in my garden and see lovely colourful flowers. 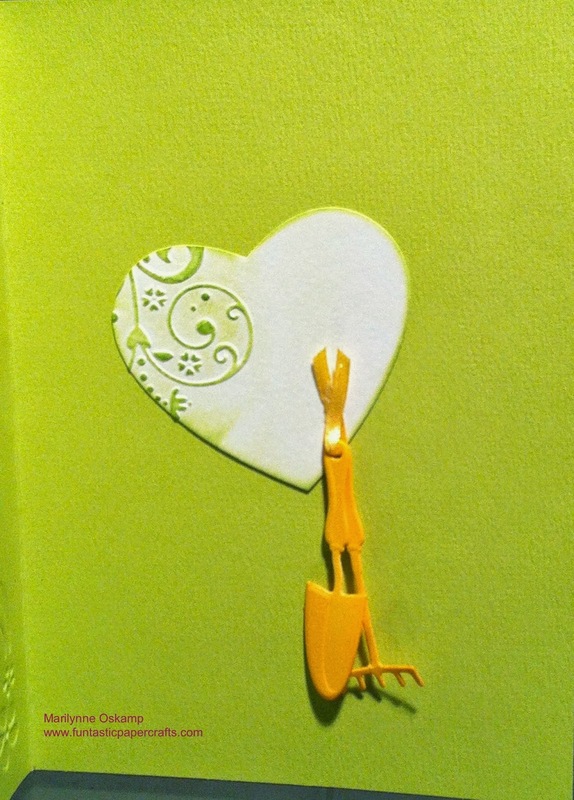 I love the dies that created the cute garden tools that I attached to the inside of the card. Cut a piece of lime green card stock measuring 10 x 7 inches and fold in half. Emboss the front of the card using the embossing folder. Die cut a large heart from yellow card stock, a medium heart in ivory and a small heart in ivory (inside of card). Die cut the garden tools and sign from yellow card stock. Die cut 6 leaves from moss green card stock. Emboss the medium heart with the polka dot folder. Emboss the small heart using a swirl design on half the heart as shown. Punch and emboss 6 medium and small size flowers. Punch the design first and then place in the embosser and press down. These punches come in pairs, the punch and the embosser. Place a small 1 mm foam tab to the bottom of the small flower and attach to the middle of the medium embossed flower to create the daffodil. Pinch the layers to create a beautiful 3-D effect. Repeat x 6. Add a little orange Pearlmaker paint into the center of the small flowers and set aside to dry. Ink the flowerpot, and the smaller heart embossed area using the pigment green pigment ink. Stamp the “Garden”sign with the Garden stamp that comes with the garden tools. Apply some clear embossing powder to the items and heat. The embossing creates some sheen and sets the ink but could be considered optional. Use a hobby knife to cut out a slit from the top of the flower pot. Attach the embossed medium ivory heart to the larger yellow heart using some foam tape and then attach both using foam tape as well. Cut a few moss green strips to serve as the stems of the flowers. Curve the flowerpot and attach with foam tabs at the bottom and sides of the flowerpot so that the center is left open to accommodate the stems and leaves. 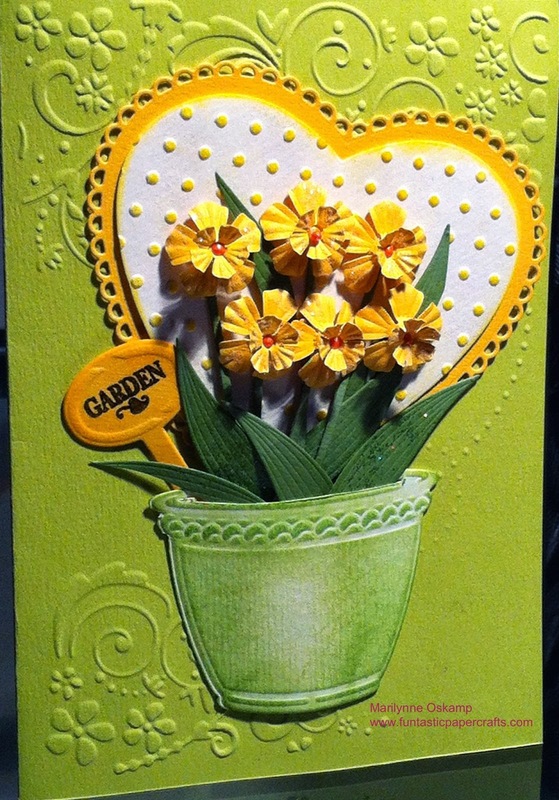 Arrange and attach the stems and the flowers to the card using different sizes of foam tabs. To ensure the daffodils remain dimensional I stacked several foam tabs together and then attached to the flower and then the card. Arrange the leaves to come out of the pot in front of the stems. Attach the ivory embossed heart onto the inside of the card. String a small piece of yellow ribbon through the rake and shovel garden tools and attach to the heart using Be Creative double-sided tape. 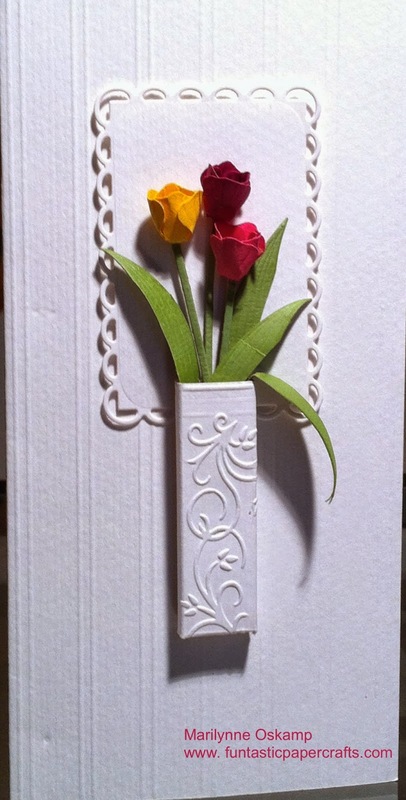 I was inspired by a few cards that I saw on Pinterest, one showing some vases on a card and the other 3-D tulips. Tulips are also my favourite flowers, so of course I had to make this "Simply Tulip" card! Cut a piece of card stock 8 ¼” x 81/4” and fold in half lengthwise. Cut a piece of card stock 2” x 3 “ . Place this piece of card stock on a scoring board and score lines at ¾”, 1”, 1 ¾”, 2”. Rotate the piece to the side and score a line at 2 ½” and along the top edge. Cut out the corner pieces at the bottom to allow you to fold into the vase rectangle shape. Use the embossing folder to emboss the front of the vase in a desired pattern. Fold and tape the vase together. Die cut a frame using the middle rectangle frame. Die cut 4 leaves. Curve the leaves and trim them to an appropriate size. Punch out one yellow, one purple and one pink flower, emboss the flowers using the embosser. To make the tulips: pinch two of the 4 petals together. Mold the tulips by pinching all 4 of the petals together. Open up the tulip again and place double sided tape on the inside of 2 of the petals. Fold up the petals again and use tweezers to hold the tape to the layers. Cut a piece of green card stock into a thin strip. Cut a small hole in the bottom of the tulip and slip the strip up into the tulip. Attach the stem to the inside of the tulip with a black foam tab. This will look like the black stamens inside real tulips and keep the strip inside. Repeat step #9 for the remaining tulips. Score the front of the rectangle card as desired. Attach the frame to the card using foam tape. 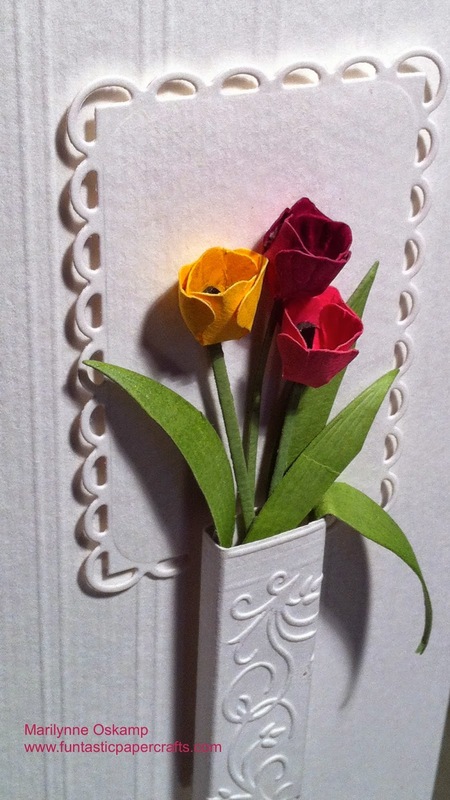 Attach the vase to the card using foam tape. Arrange and add the tulips and leaves as desired using foam tabs.